I made my draft dodger out of a design that I had cross stitched on linen, but you could make one out of any piece of fabric. 1) Start with your design or piece of fabric that is long enough to cover the door opening ( plus a few inches). 2) The edges have already been zig-zag stitched, but if you would like to make a ruffled edge, turn under the edges on the ends and stitch. 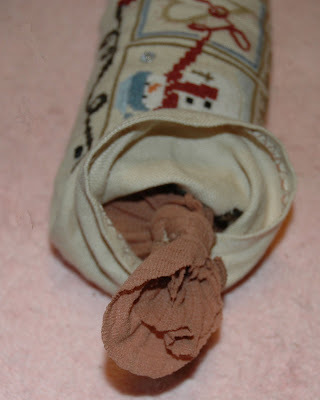 (If you do not want the tied enclosure, you can sew up the end and then later hand stitch the other end when it is completed). 3) Right sides together, pin the long edges together and sew a 1/4 inch seam. 4) Turn it right side out. You now have a sleeve. Just press it very lightly (no hard creases). 5) Next, I cut 3 pieces of floss (18 single strands) about 24" long. 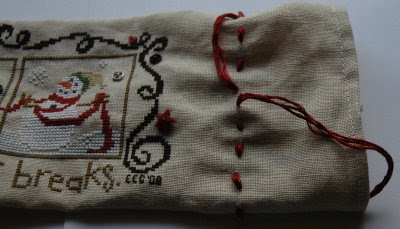 I used DMC 221 because it matched The Red Thread in my design. (You could use any cording you wanted. You just have to make sure you can weave it through the linen without ripping it). 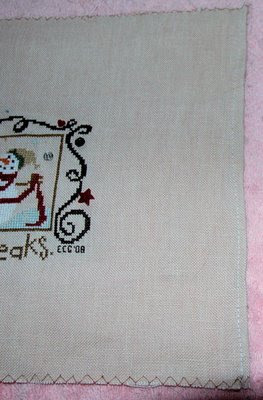 About an inch from the end of the design, starting in the front, center of the design, I wove the floss all around it. 7) The stuffing was next. For a shelf sitter, you can use a light fiber fill, but for a draft dodger you need something a bit heavier. After quite a bit of experimentation, I decided to use Feline Pine, which is compressed pine pellets. This can be found in specialty pet food stores. Do not confuse this with regular cat litter, which did not work well at all. The pellets are much larger, and it is completely dustless. Of course you can also use dried beans or rice. Although you could put the filling in directly, I decided to enclose it in pantyhose. This is a little tricky because the pantyhose will just keep stretching, so the best thing to do is to put the leg into the opening and start filling it a little at a time. 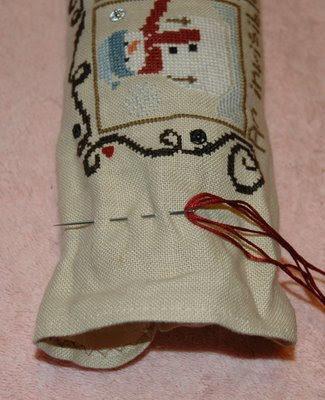 As you fill it, the weight will drag it down to the bottom of the sleeve. This works much better than trying to stuff it in. When it is filled. tie off the top of the pantyhose leg in a knot. 8) I finished the other end off in the same way, added the beads, and pulled it up tight. Fabulous!!! I love things that are both beautiful and useful and this qualifies on both counts!!! Good tip on using the pantyhose! 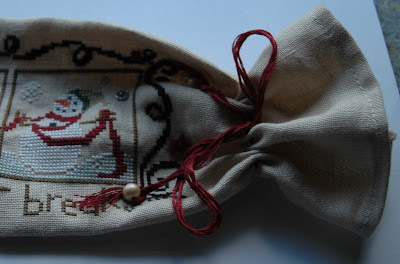 This is a great tutorial - I haven't seen anything like it before and it's certainly a creative way to utilize your stitching. I'd definitely contact some of the tutorial blogs and see if they'd list it - I bet there would be some interest in this unique tutorial! Brilliant! And a perfect use of this design. Thank you SO MUCH for sharing this.